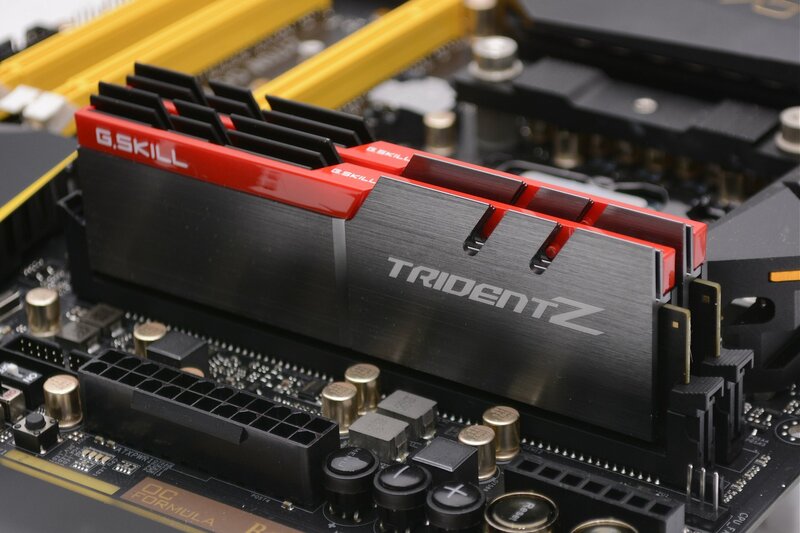 DDR4 Memory Prices: Why So High and When Will They Fall? The past twelve months turned out to be some of the most exciting times we can remember for building a new computer. Last March saw the launch of Ryzen ending half a decade of AMD being ‘bulldozed’ by the competition. From that point forward it was busy for PC hardware, including the release of new graphics cards and Intel having a second go at things with Coffee Lake after an underwhelming Kaby Lake launch. However, for as much as there was to be excited about regarding computer hardware in 2017, there was plenty to be upset about as well. Unfortunately, some of these problems have gotten worse and will probably continue to worsen throughout 2018, which is going to make it increasingly difficult to build a PC. 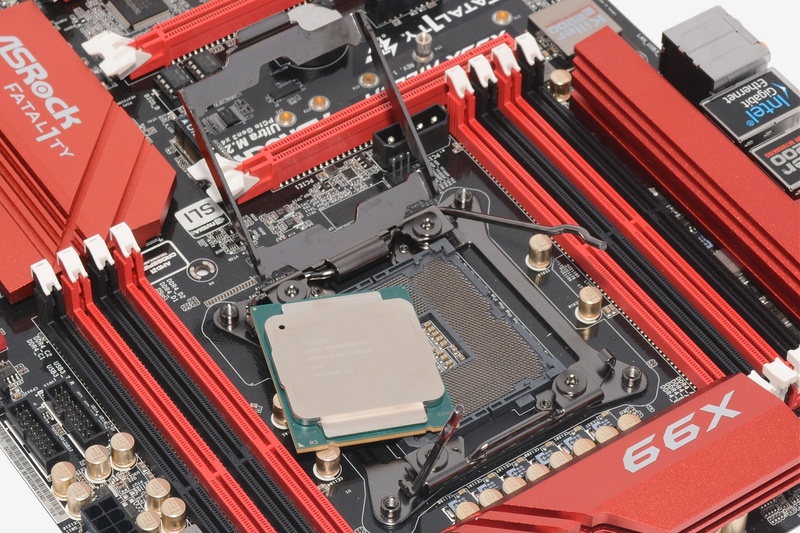 Part one of this series will be dedicated discuss DDR4 memory pricing and why it’s so high. RAM pricing is currently a big issue plaguing those wanting to build a new computer or even update an old one. 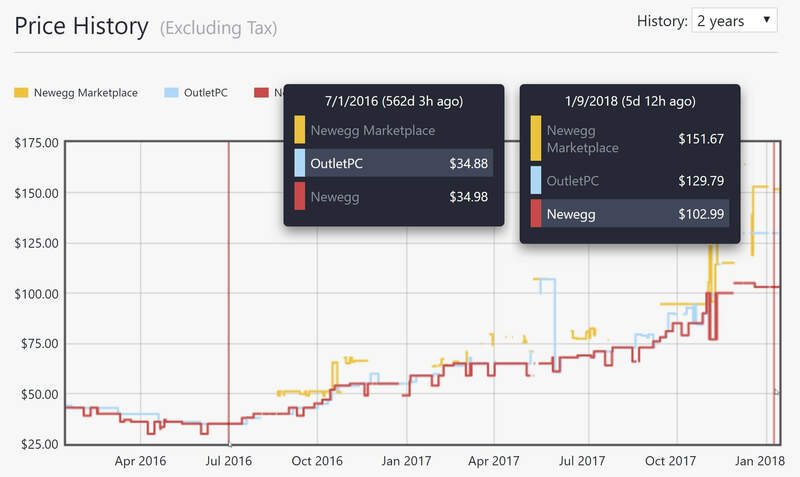 From July 2016 to July 2017, the market saw a 111% increase for the average selling price of DDR4 memory, and it has continued to increase since then. An 8GB DDR4-2400 memory kit went for around $35 in 2016. A year later you could expect to pay a little over $70 for the same product. Today you’re looking at an asking price of at least $90, or 170% more than what we were paying roughly 18 months ago. But why is this? First and foremost, it’s an issue of supply and demand. And while it’s difficult to predict exactly when supply will improve, most reports suggest this won’t happen until late 2018 when manufacturing of 64-layer and 96-layer 3D NAND flash reaches maturity. Until then, demand will continue to heavily outweight supply. So, okay, it’s a supply issue — but why? What’s the main driver behind either supply decreasing or demand increasing? I believe we’ve been faced with a sort of double whammy. The major DRAM suppliers shifted focus away from DDR4 production due to tight margins, investing elsewhere, while growth in the traditional desktop sector over previous years was slow and nobody wanted to pay a premium for DDR4 products, resulting in a loss of interest from manufacturers who couldn’t meet their planned targets and returns. With limited demand in late 2014 with Intel’s Haswell-E and Haswell-EP range which continued in 2015 with Skylake and then again 2016 with Broadwell-E, the limited supply wasn’t an issue. However, in 2017 we saw a rapid shift in market demand toward desktop computing, not just Intel but now also AMD were shipping processors supporting DDR4 memory. Perhaps an even bigger factor, the smartphone industry has increased demand of not just DRAM but NAND as well. It’s worth highlighting that it’s a different type of DDR4 memory which is produced for the mobile market (Low Powered DDR4 or LP DDR4), and manufacturers such as Samsung make more profit selling LPDDR4 memory in premium smartphones. With demand outweighing supply, prices increased and DDR4 margins were no longer tight. By mid-2017, pricing of memory modules soared significantly and unfortunately it doesn’t look like manufacturers will be ramping up production any time soon. According to market research firm DRAMeXchange, the three major DDR4 suppliers (Samsung, SK Hynix and Micron) slowed down their capacity expansions and technology migrations to maintain prices in 2018 at the same levels seen in the second half of last year, which is presumably related to their interest in sustaining strong profit margins. The construction of new fabs is underway to help the strained supply but they won’t be ready for mass production until 2019 at the earliest. It’s predicted by Gartner that DDR4 pricing will crash in 2019 and history would suggest this is likely to happen as that’s the cycle we go through every few years with memory pricing. China has the potential to change things here with its aggressive approach to the semiconductor market, which could cause pricing to become even more unpredictable. Chinese memory could flood markets worldwide causing pricing to plummet. Right now there is a large number of Chinese fabs being built and it is expected that the country will take second place for investment in semiconductors this year as it equips the many new fabs that began construction in 2016 and 2017. It’s also been reported that China’s National Development and Reform Commission is investigating the possibility of DRAM price-fixing between the major industry players, and this has of course been sparked by the price surge we’ve been talking about. If found guilty, it’s hard to predict what the ramifications would or could be, so we’ll have to see how that story plays out. It would appear as though they do have quite a bit of power here, as SK Hynix and Samsung both have a number of facilities in China. So if you have a choice: hold off on building your new PC until later in 2018 (or longer) or simply accept the hit on memory pricing. PC gamers will ideally want 16GB these days and those kits cost at least $170, with premium memory priced closer to $200. Granted, the same kit would have costed around $75 in the good old days, but try not to dwell on that. Inflated DDR4 memory pricing is only one of the problems you can expect to face when looking to upgrade or build a PC in 2018, and in the next part of this series we’re going to discuss what’s going on with GPU pricing and what we can expect later this year. We’ll follow up with part two later this week.